Three years ago, Panalpina announced its intention to deploy a single warehouse management system (WMS) across all of its logistics facilities throughout the world. 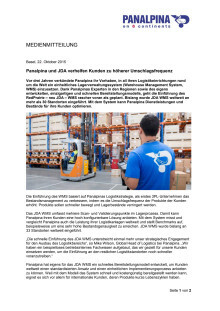 The roll-out of the RedPrairie – now JDA – WMS is progressing ahead of schedule thanks to Panalpina’s experts in all regions and a specially developed and unique fast deployment model. 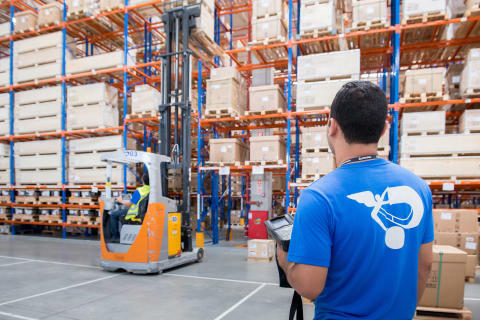 To date, JDA WMS has been rolled out at more than 30 Panalpina sites globally – enabling Panalpina to optimize service levels and inventory for customers. The WMS roll-out builds upon Panalpina’s logistics strategy to become the first 3PL (third-party logistics provider) to improve inventory management by helping customers increase asset velocity – moving products more quickly and reducing warehoused stock. JDA WMS provides for various scan-and-validate check points throughout the warehousing process, allowing Panalpina to offer its customers a highly customizable solution. Panalpina also uses the system to track and compare the performance of its four-wall operations globally and then works towards benchmarks, for example in terms of very high inventory accuracy. JDA WMS has so far been deployed in 33 sites worldwide. Panalpina developed its own rapid deployment model for JDA WMS in order to offer customers a standardized approach and consistent implementation process across the globe. 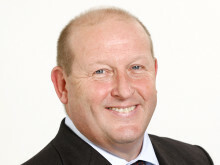 This unique model is particularly useful to international customers whose products have short life cycles, as the deployment of the system takes place quickly and cost effectively. JDA WMS also includes a feature-rich reporting and analytics module, which can be integrated into Panalpina’s data analytics services for more accurate customer inventory and demand forecasting. Panalpina uses customer data extracted from JDA WMS to map inventories across product life cycles. Using sophisticated proprietary algorithms, Panalpina then calculates at what stage the inventory changes in order to better estimate minimum and maximum inventory holding, where to position inventory and what services to offer. Customers benefit by having a partner that can keep their products moving and minimize working capital requirements in their supply chains. Panalpina calls this approach Demand-Driven Inventory Dispositioning (D2ID). While JDA WMS can be deployed for all industries, Panalpina has so far implemented the program mainly for its fashion and technology customers, which rely on a fast time to market. These customers benefit from the high levels of configuration available in JDA, and from specific features including multi-channel dispositioning, rapid returns processing and cross-docking. Panalpina most recently deployed JDA WMS for a new high-end fashion customer in Italy. Panalpina’s Mendrisio fashion hub in southern Switzerland uses JDA WMS to provide the customer with inventory management and distribution services around the world. The fashion house’s merchandise is produced in northern Italy and then imported to Mendrisio, where Panalpina’s bonded warehouse can facilitate distribution within Switzerland or re-export it to Europe and other key markets. Panalpina also offers a full returns logistics program at Mendrisio, accepting returned goods back into the facility and determining their quality, in order to return them quickly to stock in boutiques or outlet stores and maximize sales. “JDA and our unique rapid deployment model have allowed us to offer our customers agility, speed and the flexibility to meet their needs across regions and industries. We efficiently track and manage their inventories and move their products as needed,” says Mario Leuverink, Global Head of Logistics Systems at Panalpina.